Born at Northallerton, 28th August, 1892, son of Major William Auschar Chauncy, 19th Foot. 2nd Lieut., 20th September, 1911 ; Lieut., 24th October, 1914 ; Adjt.. 1st August, 1915—17th June, 1917 ; Capt., 1st January', 1917 ; Adjt., 3rd Battn., 13th March, 1920 ; re-appointed Adjt., 2nd Battn. 22nd November, 1922, to 15th August, 1925 ; retired, 29th June, 1928. Went to Belgium with 2nd Battn. in October, 1914, and was present at the fighting at Ypres, and at the battles of Neuve Chapelle, Festubert and Givenchy. Wounded at Loos, September, 1915. Served with the Royal Air Force as Wing Adjutant, and on the staff from February, 1917, to May, 1919 (1914 star, silver and bronze medals). John Sly (<sly211@btinternet.com>) has researched the career of Lieutenant Chauncy in connection with Lieutenant Chauncy's medals. John has written a short biography of Lieutenant Chauncy, below. Army Medal Office rolls confirm the award of the 1914 Star and Bar, giving two dates of disembarkation: Roll 5 October 1914 and GOC 6 October. The record also shows that he served in the Royal Flying Corps as acting Major. He was mentioned in Sir John French’s despatch of 31 May 1915, published in the London Gazette 18 June 1915. Born 28 August 1892 at Northallerton, Yorkshire, he was the son of William Auschar Chauncy, Captain, Princess of Wales’s Own Yorkshire Regiment, and his wife Frances Mary (née Thomson). He entered Mr Owen’s House of Harrow School, Easter-Midsummer 1906, leaving 1910/2. He was listed in the Harrow School Register as having been twice mentioned in despatches. He was the Transport Officer when the 2/Yorkshire Regiment embarked for France 5 October 1914, and it was largely owing to him that the transport brought up 96,000 rounds of ammunition every night during the First Battle of Ypres. "...Chauncy got a nasty wound through the chest (it only just missed his spine). He, however, still continued doing his duty, actually carried one or two messages to Company Commanders, and incidentally was nearly captured on his way back to the dressing station". After his wounding he was not passed fit for active service, and was seconded to the RFC where he undertook various administrative duties including that of Adjutant, Central Flying School. He returned to the Yorkshire Regiment as Adjutant of the 3rd Battalion at the Depot, Richmond, 13 March 1920. He was fond of fast cars, and there are several entries in the Depot Notes in the Green Howards Gazette relating to this. In the Notes published in May 1921: "Chauncy has returned from a fortnight’s leave, during which he attended the Easter meetings at Brooklands and achieved fame by appearing (amongst the crowd) on the cover of the ‘Light car and cycle car’. Rumour has it that he contemplates taking on the ‘Chitty Bang Bang’ (600 hp) in his sporting Calthorpe". In the Gazette for August 1922: "At the end of June Chauncy met with a most unfortunate accident to his car, when the whole thing was burnt to a cinder. After writing copious letters and spending many sleepless nights, he now has a Sports Morris Cowley, which has already done 65..." The fire was apparently caused by the careless disposal of a match by Robert Ledgard, a fellow officer, which ignited the petrol that Chauncy was putting into the tank. He attended a Levee held by the king at St James’s Palace 4 June 1923. He retired in June 1928 to his house in Midhurst, marrying Miss Renee Reel in 1929.
stroke; a detailed obituary was published in the Green Howards Gazette for February 1958. This mentioned in particular his passion for the internal combustion engine at the expense of the horse, which did not endear him to the older members of the regiment. 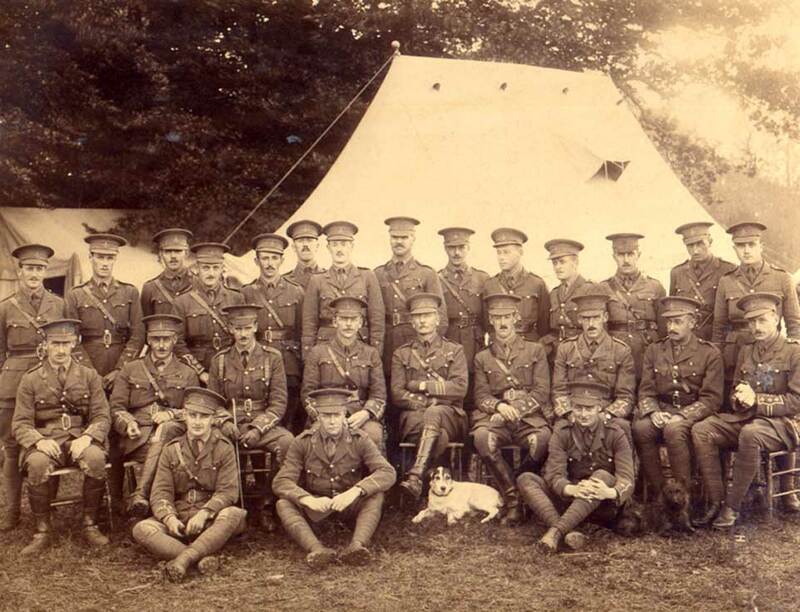 He is included in a photograph of the officers of the 2nd Battalion taken at Lyndhurst 24 September 1914, and published in the Green Howards Gazette for November of that year, and in a photo of the Sergeants Mess at the Depot in 1921.